Use this (pretty obvious) game plan to earn 2000 points and the second office without really doing anything. Any other ones I forgot. You may notice that this only gets you up to 1600 or so. 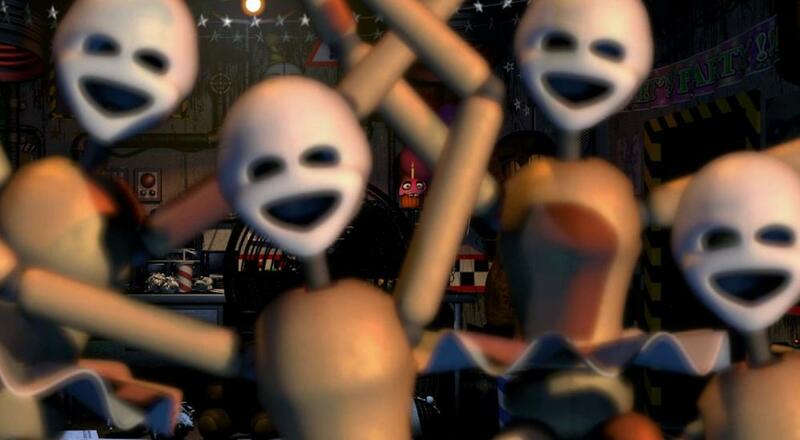 That`s because, in order to push it over the edge, you also need to turn on some animatronics that can kill you, but are only dangerous under certain conditions, which the other animatronics in this setup don`t meet. These are Bonnie, because without Foxy he`s an empty threat, and Rockstar Foxy, because you won`t be needing any help from him and his bird. Just start the night and hit cruise control. You can`t just leave your PC, of course, because the office will still heat up and you`ll still need to reset the ventilation every now and then. Other than that, you can just sit in your office and listen to the cool, creepy ambience that you don`t have time to pay attention to with most other setups. (Also, don`t look at Pirate`s Cove, obviously.) After 4 minutes and 30 seconds of some minor annoyances, you`ll get a high score you don`t deserve, as well as a new office and some fanfiction. For bonus points, you can try turning on some other animatronics that would be scary on a more hectic setting, but are relatively easy to deal with otherwise. My personal recommendation is to have all the mask animatronics (Withered Bonnie, Toy Bonnie, and Toy Chica) for an extra 600 points you might deserve a little bit and some more fanfiction. You can also try Afton if you`re feeling adventurous. Another warning: Dee Dee WILL murder you on this setup if you don`t repel her somehow. She might be even more dangerous on this setup than most others, because all the animatronics you just turned up to the highest difficulty are designed to make other animatronics more powerful and sap your ability to avoid them. If even one new animatronic enters the fray that`s prepared to kill you, you will die to it. I promise you that.